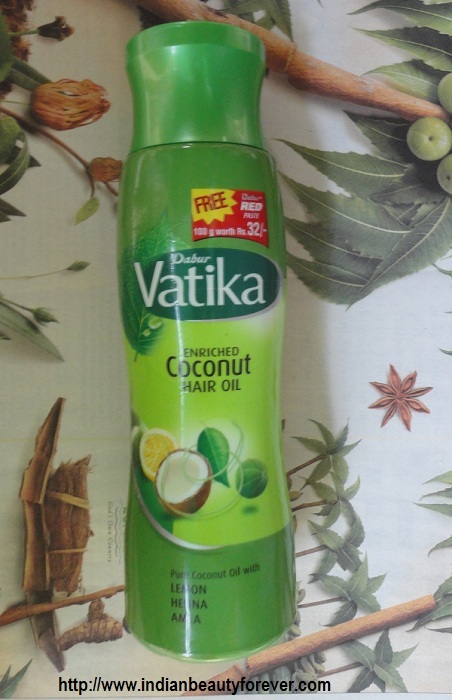 I will today,shre my views on the Dabur Vatika Enriched Coconut Hair Oil. I love this oil a lot. It has some of the very good ingredients that makes hair healthy and shiny. Packaging- Green color tall bottle with light green color screw cap. About the product-Vatika Coconut Oil for hair provides natural nourishment to your hair, giving it body & radiance while taking care of the critical balance of nutrients. Unlike ordinary coconut oil, Vatika's coconut oil is enriched with the goodness of 8 time-tested herbs. They work magic on your hair, giving your hair & scalp complete nourishment for that problem free, healthy crowning glory. Ingredients- Dabur vatika hair oil contains 8 Magical Ingredients: Triphala, Brahmi, Henna, Neem,Lemon, Rosemary Oil, Kapurkachri, Soya Extracts. Coconut oil (Cocos nucifere oil) Neem (Azadirachta indica Leaf extract) Brahmi (Centella asiatica Plant extract) Fruit extracts of Amla Bahera and Harar (extracts of emblica officinalis Terminalia belirica and Terminalia chebula), Kapur kachri (Hedychium spicatum rhizome extract) Henna (Lawsonia inermis leaf extrac) Milk (lac) Rosemary oil (Rosmarinus officinalis oil) Lemon oil (Citrus limonum oil) TBHQ (t-butyl hydroquinone) Fragrance. Henna : along with other herbs coat your hair and protects it from oxidation. Amla : strengthens the roots of your hair to help maintain their health and natural thickness. Lemon : has an astringent action which controls the flow of sebum. 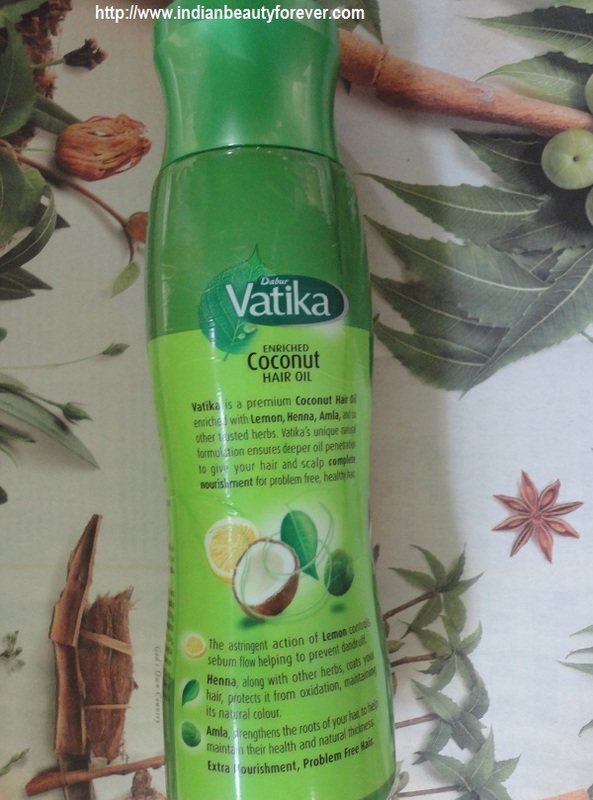 What the company claims- Vatika is a premium coconut hair oil enriched with lemon, henna, amla, and other trusted herbs. Vatika’s unique natural formulation ensures deeper oil penetration to give your hair and scalp complete nourishment for problem free, healthy hair. Usage- Apply regularly on scalp & hair. For best results, massage & leave it on overnight. My Experience- I usually don’t apply hair oil on a regular basis to my hair. I just apply ordinary coconut hair oil once in a week before taking hair wash for little conditioning. As always I happened to get scolding from my mom for not applying oil to hair daily. I wanted to go with my mom’s words so started using it a 2 weeks at a stretch and I should say it provides really complete nourishment t o the hair. This hair oil is light green and non sticky. But don’t dare to go out with oil on my head and its amla/henna smell on me. It made my hair little softer and black. I m little sad about this blackening thing as it ripped off my colored hair L But those who hate the brownish hair and want a real black hair can very well use this. I don’t have dandruff, so I cannot say if it acts on dandruff. And the hair growth is normal like before and one cannot expect miracle happening in a night. Totally I would say this hair oil is really enriched hair oil than ordinary coconut hair oils. My Take- Very nice oil that does what it claims.I will recommend it!! I have used this oil, good product. thanx 4 dis post..presently iam using parachute...bt vl jump to dis...!st iam in ur space..really its a gud blog.visit mine if ur free n plz check out new FB page too dear. Nice Monissha! I love coconut smell! Hey Niesha, can you please vote for 'Beauty and the Mist' as one of the best Greek beauty blogs? You only write your name, email and choose 3 blogs from the list. Thank you in advance!